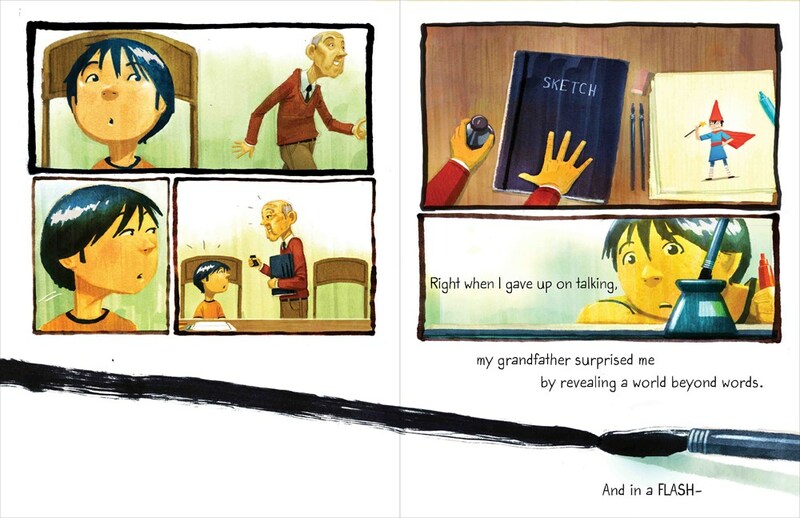 Drawn Together byMinh Lê Dan Santat is a breathtaking picture book of few words about the challenges of finding a common language. It is also a book I will never forget. A boy is dropped off at his Thai-speaking grandfather's and the differences are immediate and vast - from food to language to television shows. Giving up, the boy wanders off and takes out his sketchbook. 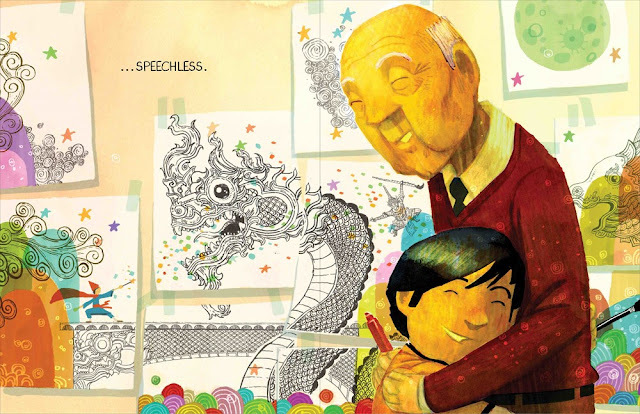 Seeing the colorful boy with a wizard hat and wand that his grandson has drawn, the grandfather gets out his own sketch book and reveals an intricately detailed warrior wearing traditional Thai ceremonial clothing, a paintbrush for his sword/wand. 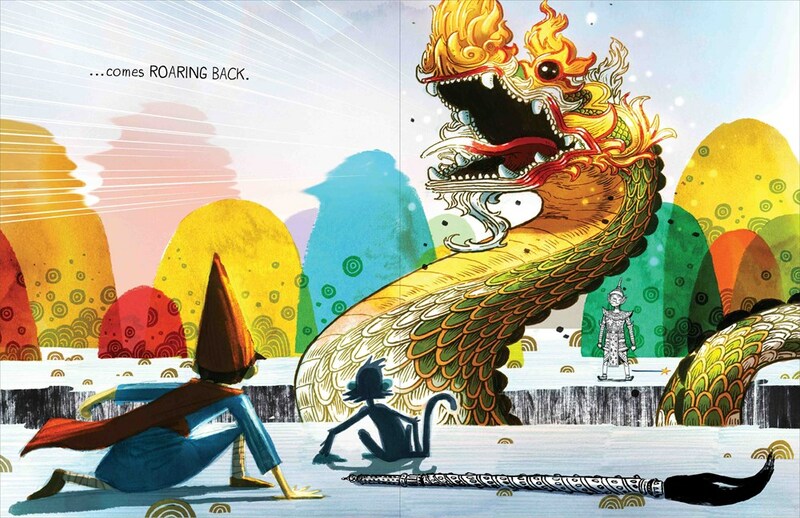 Santat's illustrations explode with magnificent bursts of color and detail as the two worlds come together. Despite their connection, the "old distance," the divide of cultures and languages, comes "ROARING BACK." Separated by this divide, the boy has his grandfather's paintbrush and his grandfather has the boy's wand. A bridge (that , cleverly, appears to be built on the back of the dragon) appears and the boy and grandfather are reunited. 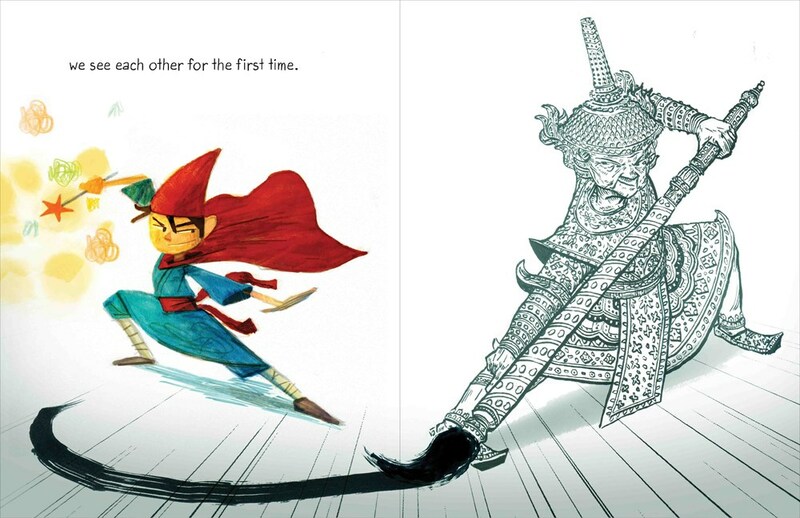 Santat's illustrations alternate from panels to two page spreads and I have to admit, there were times when I felt Lȇ's words were almost an intrustion, slowing the flow of the story playing out in the illustrations. Lȇ is a first generationVietnamese-American and Santat's parents immigrated from Thailand. 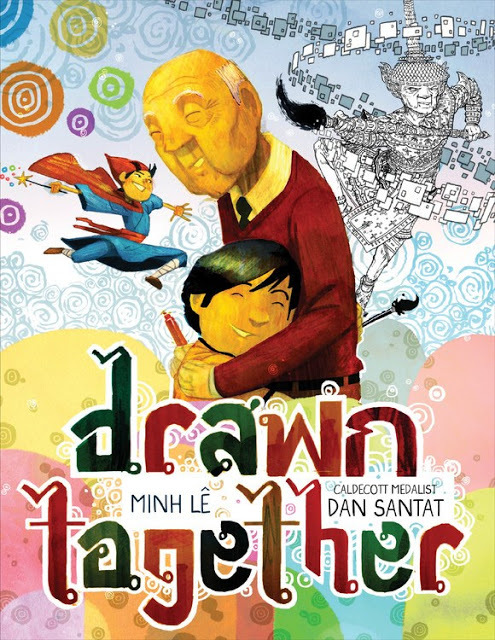 It is Santat's Thai heritage that finds its way to the pages of Drawn Together, from the font of the title, which is derived from the Thai alphabet to the words spoken by the grandfather, transcribed and translated by Nancy Santat. Be sure to watch the short video below where Santat discusses the process of illustrating Drawn Together.